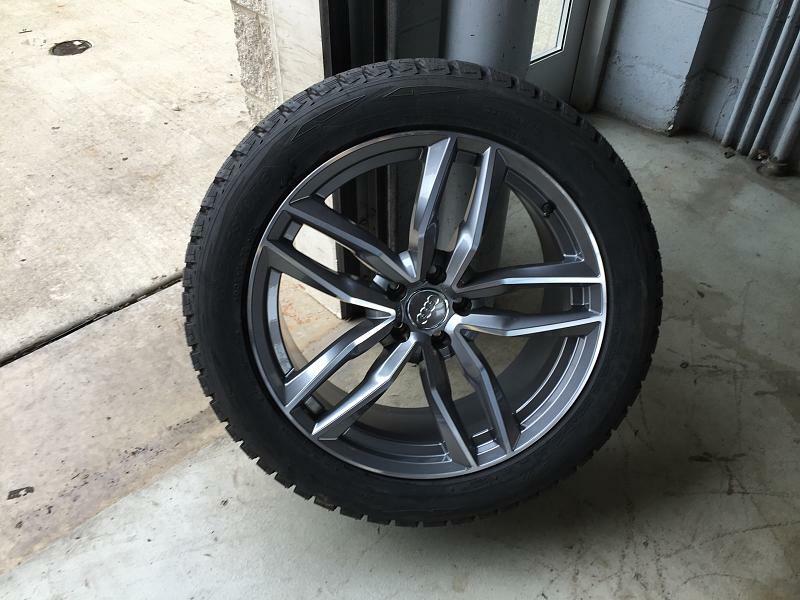 Winter tires for new Q7? Did you mean aftermarket 20s that are the same design as the original Audi 20" wheels? If so, could you please share where you got them? I have the 21" wheels (on summer tires) and I'm trying to decide what 20" wheels to get for my winter setup. Tires will be Nokian Hakka R2. Actually, they're the same specs but not the same design as the 20" 10 spoke OEMs. I got them on eBay from a dealer in Phoenix Euro Wheels USA - Aftermarket Wheel Dealer Phoenix I got them several months ago so I don't know if they still have this exact wheel. If you check eBay, you'll find several of a similar design except they are 35 offset instead of 33. I got the specs from my dealer's parts dept for the OEM 10 spokes that are available on the 2017 Q7 & these were identical (20x9, 5x112, ET33). I was a little skeptical of replicas, but my tire guy that I trust inspected them & said they looked like very good quality to him. The thing I liked about these was they are identical in design (with slightly different finish) to my 21's with the summer tires, except these are 20" which is more suitable for snow. Last edited by Cadx6; 10-01-2016 at 05:27 AM. Sorry, I didn't realize we had PM'ed each other a few weeks ago. But thank you again for sharing. I too have the 21s and love the design. Most likely, I'll get these exact ones that you have in 20". I'll reach out to the Phoenix dealer. Hartmann makes a very similar wheel, I wonder if it's the same. If it helps when you contact them - the Manufacturer Part Number shown on the listing I ordered from is rad-1196-2090-5112-ES. I'm actually looking forward to switching for the winter so I can see how they look & perform . I have 275/45 R20 Hakka 8 studded tyres. What size Blizzaks did you get? Cadx6, If you don't mind sharing, how much is your tire guy charging you for storage? The local Audi dealer here charges $125 per season (so $250/yr), and I'm wondering if that's the norm. LarryV and others, are you choosing to have the spare set stored at the dealer/tire place or just at home? Has anyone tried transporting 4 tires (mounted on 21" wheels) in the back of their Q7? I wonder if they would fit with the 3rd row down, in case I decide to store them myself and have to lug them home. I store them at home and will be doing the seasonal wheel swaps myself. A set of 4 mounted tires on wheels will fit in the Q7, but in addition to the 3rd row folded down, you will also need to fold down at least 2/3 of the 2nd row seats. I just did this recently to bring my winter set home from the tire shop where they were mounted and balanced. Do you have the tire totes with the felt pads to store the other set? They look like they'd make the lugging and storage a bit easier. I'm buying aftermarket wheels and Nokian tires, neither of which the dealer carries, so i'll have to buy online myself and have them shipped to the dealer. Given that, I'm wondering if I'd be better off just going to a tire shop for the mount/balance/install. Any thoughts? Last edited by NGN; 10-31-2016 at 06:25 AM. Did your winter wheels come with conical lug bolts? Larryv, in another thread had cautioned us against using ball bolts from the OEM wheels on aftermarket wheels that may have conical lugs. Wondering what you ended up doing? Quick Reply: Winter tires for new Q7?